At a time when North Korea is threatening a number of countries and the schools in the U.S. are thinking about armed guards, Infinite Progress brings a fresh and positive perspective on where the human race is headed. Its author, who is currently responsible for R&D at Demand Media, has also started several new technology ventures of his own. 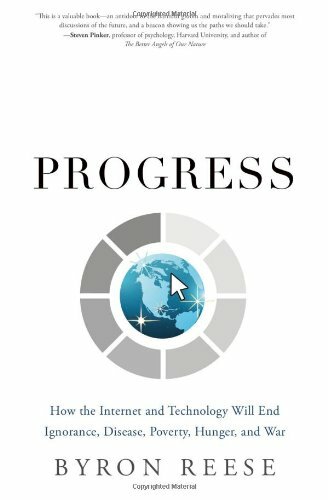 Infinite Progress is a must-read for futurists, a book sure to be applauded by technologists, and a possible source of new ideas for those interested in generational perspectives. Byron Reese has founded several high-tech companies and has also obtained or has pending numerous patents in disciplines as varied as crowdsourcing, content creation, and psychographics. Together the websites he has launched have received over a billion visitors, covering a variety of topics including news, reference, and history. Mr. Reese writes with the authority of someone who has developed groundbreaking technologies and made money doing it. In other words, he writes as an evangelist. He is a true believer that the current boom in technological innovation is propelling us toward a brave new world. Mr. Reese’s book is an effort at selling us on the notion that current technological developments are on a track that will eventually lead to an end to ignorance, disease, poverty, hunger, war. These are the areas around which his book is organized. As deftly as any novelist, Mr. Reese blends inferences about the future with historical facts and current developments in each domain. For anyone who comes from the high-tech world or today and/or who is part of the economy that is enjoying the huge revenue gains it is generating, Mr. Reese’s optimism may seem to have a strong foundation. Even many of us who do not come from the same background may agree with many of his conclusions. Especially in light of the truly phenomenal changes in the world that technology has brought about in the last decade, we are likely to see others only dreamed of before; however, like many evangelists, Mr. Reese is selective in the facts he cites, and there are many that could be used to counter his arguments. Moreover, the changes of the last ten years have certainly not had the breadth of impact that the author implies. Ask the many retirees and older adults who have been outsourced by technological change and for whom the present and future don’t seem so rosy what the future holds, and they may describe the prospects quite differently. In short, Infinite Progress is a fun, upbeat book full of speculative insights many readers will enjoy. Mr. Reese writes well. Moreover, he has pulled together some research that is valuable in terms of creating one perspective on today’s world and where it is headed. That said, there will also be readers who will shake their heads and respond, “Yes, but . . .” because there are many facts about today’s world that his theses do not account for. Exceptional Executive Coach (as ghostwriter). Ms. Publisher at AMACOM and the American Management Association.